The creative. The nerd. The suit. Three different disciplines. Three different domains. Three different clichés. Divided by decades of conceptual and cultural barriers, these tribes have been entrenched in their separate identities. There were marketing conferences, which technologists didn’t attend. Tech conferences, which marketers didn’t attend. And management, as a discipline, was rarely discussed at either. Digital transformation, the disruptor of so many things, is disrupting that taxonomy too. Because in a world of intensifying global competition, accelerating technological change, and rising customer expectations, that old model of three separate disciplines fails to innovate across them. Yet that is where the most transformative possibilities await. A new, unified model is emerging to unlock that potential. 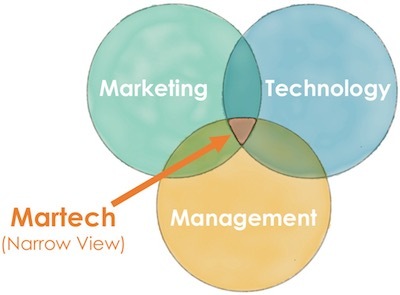 The narrow view of martech— marketing technology — is that it’s the intersection of these disciplines. A Venn diagram, where three giant circles overlap, but just a little. Through that lens, marketing technologists are a small but growing group of hybrid professionals who manage that intersection. They build both brands and systems. They span marketing and IT, bridging those two silos. But still, those departments remain rooted on opposite sides of an organizational chasm. That narrow view of martech is, as a software analogy, a patch for a program that is woefully outdated. It’s a bug fix for WordStar in an age of Google Docs. The grand view of martech is much bigger than that. In the grand view, these once separate disciplines are increasingly inseparable. The three circles of the Venn diagram overlap almost completely. Marketers embrace technology to deliver compelling campaigns and remarkable customer experiences. Technologists embrace user experience design and growth hacking principles to create products that people love and love to share. Management synthesizes the myriad of elements across them into a cohesive whole, greater than the sum of its parts. The boundaries blur, and that’s a good thing. It brings the customer into focus. Managers embrace distributed leadership, giving teams the power to sense and respond to a rapidly changing world. Strategy becomes more bi-directional, a shared vision that adapts to emergent opportunities through continuous experimentation. The brand ideal is made real, and relevant, every day. Because martech isn’t just technology. It’s the people and processes that leverage technology in the pursuit of that brand ideal. Martech = people, process, technology. Tuning the people-process-technology triangle is the art of management for our digital age, and it’s more malleable than ever before. Imagination is its greatest resource. This enlightened model of management is owned by everyone. It’s less top-down and more of a living network, swift to evolve in a disruptive environment. It is agile in spirit and practice. In the grand view, everyone who affects a customer’s experience is — in some proportion — a marketer, a technologist, and a manager. In martech, they are a united tribe, but not a homogenous one. Individuals still bring different talents, experiences, and specialties, and there’s great strength in that diversity. 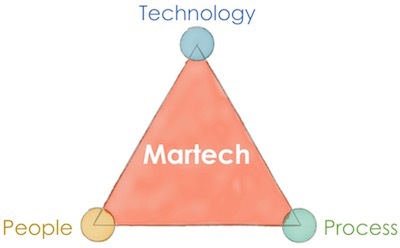 But the martech tribe holds more in common than the three independent disciplines from which it arose. Its core belief is that these are now interdependent aspects of the same merged mission: the design and development of extraordinary experiences. Their bonds are greater than their boundaries. 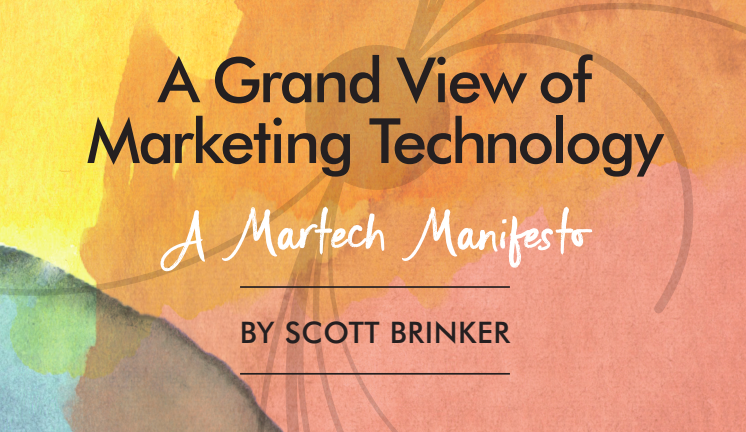 In the grand view, martech is the new marketing, the new IT, and the new customer-centric management. It creates, connects, and collaborates across all of these domains. Above all, it embraces learning beyond labels. Marketing, technology, and management were silos of the past. 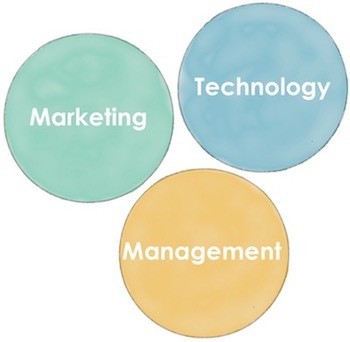 Marketing technology management — martech — is the fabric of the future. 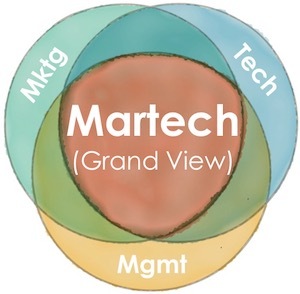 This grand view expresses our guiding vision for The MarTech Conference. We seek to cross-pollinate the best ideas and latest innovations across marketing, technology, and management. But more importantly, we strive to reveal the beautiful entanglements between them. MarTech is a marketing conference for technologists and a tech conference for marketers. Management, as a discipline, is an integral and essential part of the program. Not every organization is ready for marketing, technology, and management to converge. But our goal is to enable the present and future leaders who recognize the synergies between these disciplines to drive change and demonstrate the power of a united martech tribe. P.S. – Here are more reasons why you should attend MarTech.